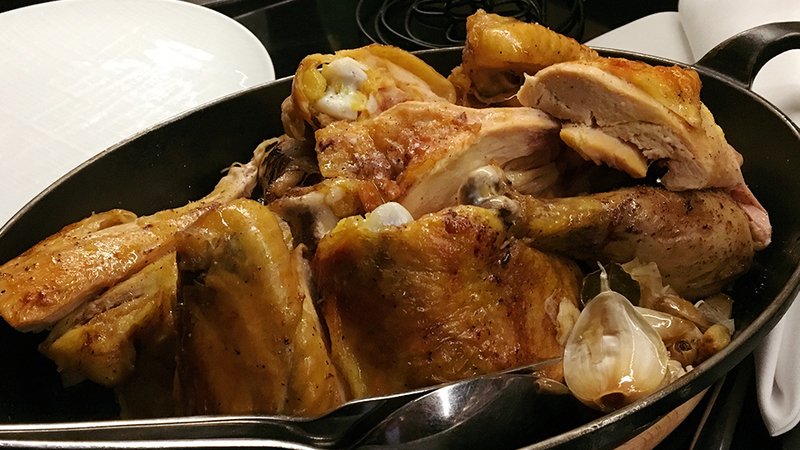 There is something about the simplicity of a perfectly cooked bird that gets me every time. This recent dinner at Le Coq Rico was one of the best meals I have had in New York City in a long time. A small group of friends gathered at the bar for front-row seats as we watched the action unfold in the kitchen in real time. 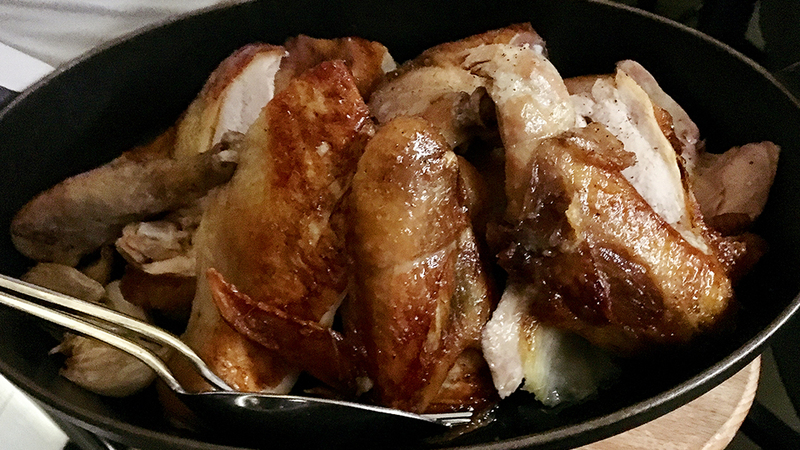 Chef Antoine Westermann’s menu offers numerous choices, but the main attraction is range of whole heritage birds that are poached and then roasted on the rotisserie. Westermann and his team work with a number of small, family-owned farms that raise their birds with traditional methods. Most of the birds on this night are from farms in New York State and Pennsylvania. 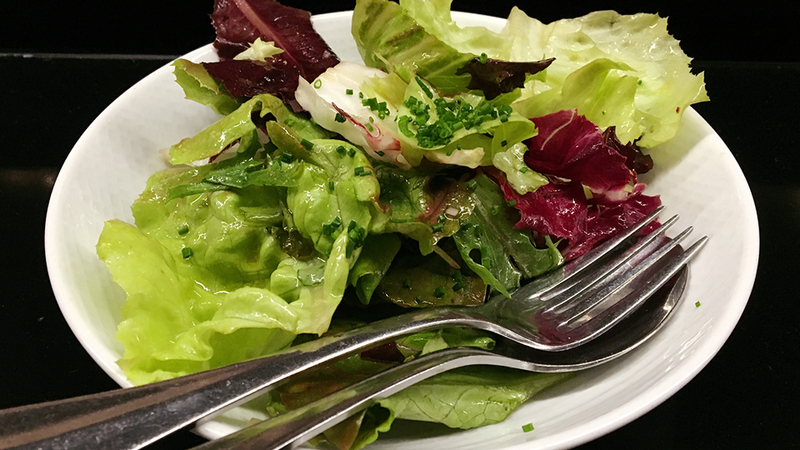 We order the Catskill Guinea Fowl and the Brune Landaise, both of which are served au jus and with a seasonal side salad, all family-style. The Guinea Fowl is more of a lighter-meat bird, while the Brune Landaise is quite a bit darker, richer and gamier, but equally delicious. According to the menu, each bird serves up to four people, but that would have to be four hungry people. 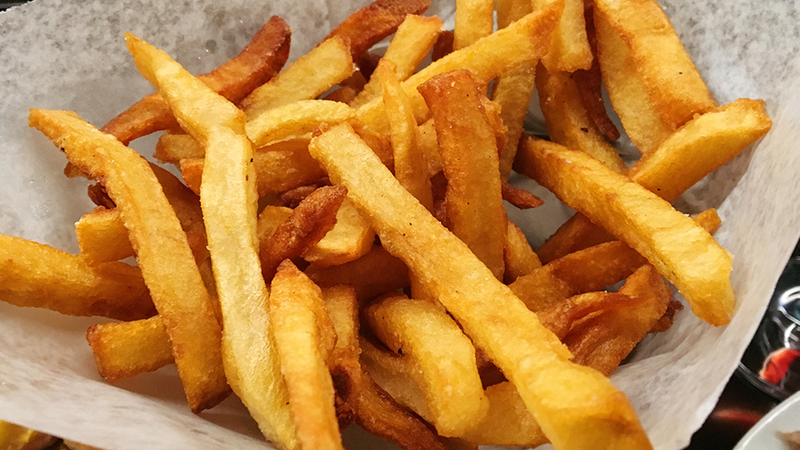 Several orders of Le Coq Rico’s thick-cut fries disappear as we devour our birds in short order. Le Coq Rico's cheese plate is good, if not especially imaginative. The 100% chocolate profiterole lives up to its name and is quite good, but not memorable. No matter, the whole roasted birds, ambience and attentive service are all tops. A generous glass of the 2011 Corton-Charlemagne from Coche-Dury is a fitting way to start dinner. Fresh, vibrant and full of citrus/mineral/floral notes, the 2011 is painfully young. Even so, it is a real treat to taste and drink this striking white Burgundy in what is clearly an embryonic stage. I prefer Coche’s Charlemagne when it is 15-20 years old. Admittedly, a chance to taste the wine at that age doesn’t exactly come around every day. This is a fine example of Rouget’s 1996 Vosne-Romanée Cros Parantoux, and certainly better than a bottle I had a few weeks prior. Dark, dense and powerful, the 1996 exudes an almost shocking level of depth for a wine of its age and this vintage, in which the wines are generally more austere. The new oak signature is still quite evident. Although not especially complex or nuance, the 1996 is a quite enjoyable. 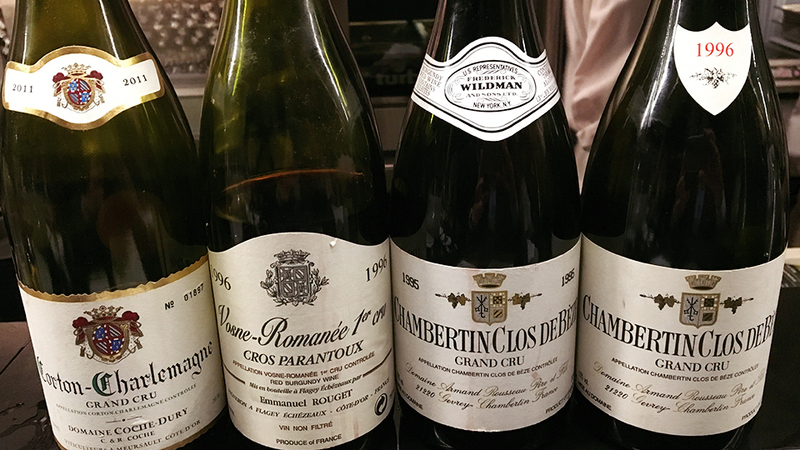 It’s fascinating to drink Rousseau’s 1995 and 1996 Chambertin Clos de Bèze side by side. Floral, perfumed and super-expressive in its bright, red-toned fruit, the 1995 shows the more graceful, restrained side of Bèze. The 1996 is a richer, more spherical wine that engages all of the senses with its kaleidoscopic, multi-dimensional personality. A host of dark cherry, plum, smoke and licorice nuances all flesh out in this effortless, super-expressive Burgundy. Domaine Dujac’s 1990 Echezeaux is undoubtedly very pretty, but it is also a bit light and ethereal in feel. Floral and savory, with lovely aromatic lift, the 1990 is quite tasty, although I don’t see it being especially long lived. 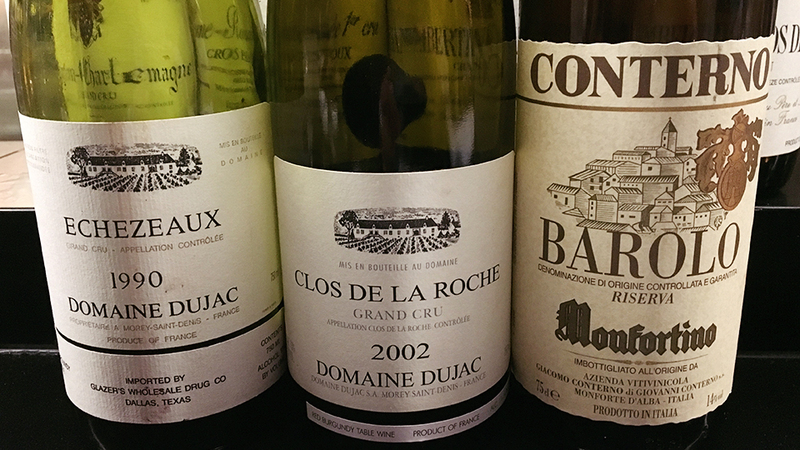 Things take a much more serious turn with Dujac’s 2002 Clos de la Roche. The purity of the flavors is otherworldly. If anything, the 2002 still needs time to be at its best. Bright red cherry, pomegranate, wild flowers and herbs are woven together in a wine of nearly indescribable beauty. Time in the glass brings out myriad shades of dimension and texture. The 2002 is still young, but it clearly has a very bright future. This is an especially fine bottle. Giacomo Conterno’s 1995 Barolo Riserva Monfortino is just beginning to enter the early part of a plateau of optimal drinking that will unfold over the next 20-30 years. Time in bottle has softened the tannins to some degree, but the 1995 still has plenty of old-school Barolo grip. Red-toned fruit, savory, floral and mineral notes pulse with tremendous energy. The 1995 Monfortino is the perfect wine to carry us into the cheese course. I am not much of a desserts person. Instead, I savor one last glass of this magnificent Barolo before dinner wraps up.